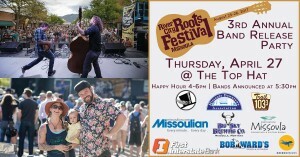 Roots Fest lineup coming Thursday! Last year Lil’ Smokies and Rodney Crowell blew the roof off of downtown to close out two nights of Roots Fest. Could this year’s festival be any bigger? It’s time to find out! Join the Trail 103.3 LIVE on Thursday, April 27, as we unveil the lineup for this year at the 3rd annual River City Festival Release Party at the Top Hat Lounge. Enjoy a special happy hour starting at 4 pm, with the big announcement coming at 5:30. If you can’t make it in person, be sure to keep your radio tuned to 103.3 FM for the announcement! This year’s festival is set for August 25-26 in downtown Missoula, Admission will again be free, with music all day on Main Street plus all kinds of food, art and family-friendly activities scattered across downtown all weekend long. Click HERE for more details, and we’ll see you there!